The visible progress on my Antarktis has slowed considerably but I'm inching towards the finish line. I'm also nearing the end of My Familiar Stranger. This book has a strange mix of multiple dimensions, elves, nice vampire, vampire hunters and humans. Somehow the author manages to weave them all together into a mostly believable romance novel that I'm actually enjoying. It helps that the nice vampire has just enough 'bad boy' in his past to make him lovable instead of wimpy. 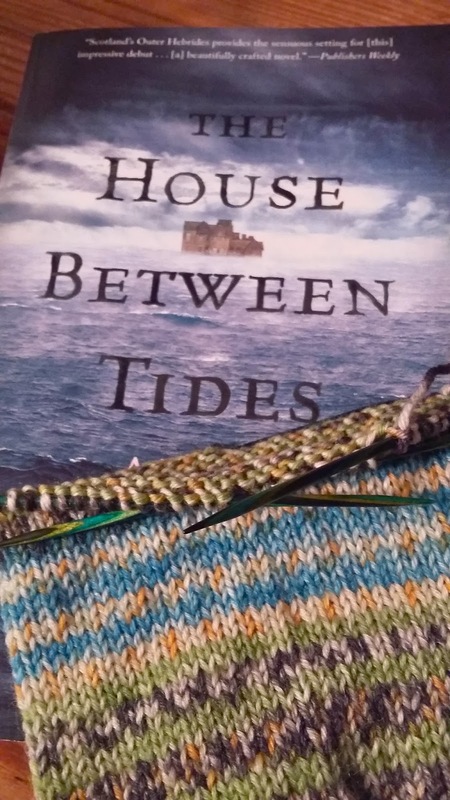 I'm enjoying reading this book almost as much as I'm enjoying knitting Antarktis. Have you ever wondered about the difference between knitting two together through the back loop versus slipping two stitches then knitting them together? I've always thought of the two methods as interchangeable. Apparently, there is a difference. 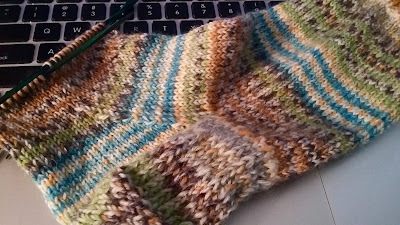 For the gusset on these sock heels, I accidently knit through the back loop on the top sock and SSK'd on the bottom sock. Can you see the difference? The back loop method has a slightly flared, wavy line to it while the SSK version formed a much straighter line. I'm not going to bother fixing my mistake. The socks are for me and I doubt anyone but a fellow knitter would ever notice the error and I further doubt too many knitters will be checking my heel gussets once the socks are on my feet. I'm claiming no harm, no foul on this one, but it is nice to know that there really is a difference. A tiny difference that could be huge in certain designs. And since this is Wednesday and I'm joining Ginny's Yarn Along, I'll tell you what I'm reading this week. I'm reading Victoria Danann's My Familiar Stranger. It's the first in a series of books about a secret society that fights vampires. At least I think that's what it's about. I'm 29% into the book according to my Kindle and haven't seen any vampire action so far so maybe I'm confusing this book with something else. I do know it's the first in a series and it's currently free on the Kindle. And, I'm enjoying it with our without vampires. 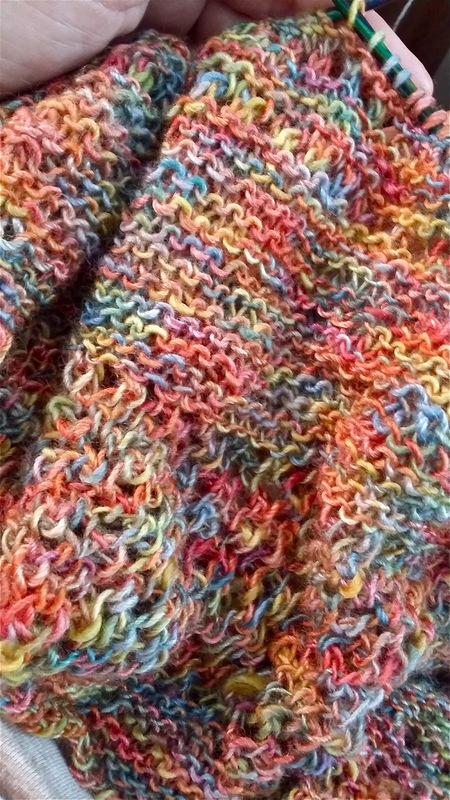 My knitting has been sporadic at best for the last week. There was that nasty eye infection (which spread to the other eye,) there was family 'stuff' and of course, there was work. Work got the better of me and I ended up falling apart and going home early Sunday night. I honestly don't understand how I could possibly come down with a different sickness with all the antibiotics pumping through my system but apparently it is possible. Monday morning I woke up long enough to call out sick then went back to sleep until about 7 p.m. It's amazing what 19 hours of sleep will do for you. Actually, it was more like 19 hours of coma. It really is amazing what 19 hours of sleep/coma can do. I feel much better but I also have one sunburned knee. Apparently, my curtains were open and one knee was sticking out from under the covers. Oh well. The sunburned knee just goes along with the still red, puffy eyes. It's a look. Thanks to a bit of gentle persuasion from Karen over at Pumpkin Sunrise, I cast on my own version of Antarktis shawl this morning. It doesn't look like much yet but I feel unbelievably productive. Row-count wise, it's a crazy fast project to knit. At least it starts out that way. We'll see how fast it feels when there's almost 200 stitches on the needle. 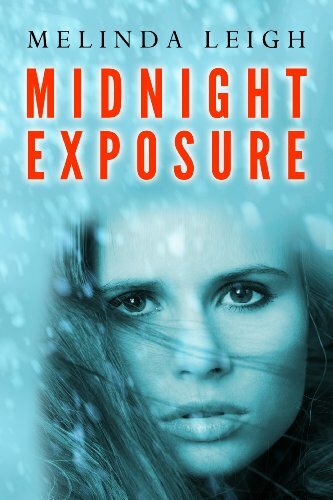 and I'm reading Midnight Exposure by Melinda Leigh. I'm struggling with this book because it's hard to put down. It's a good story and about the only time I have to read these days is the very early morning hours after I get home from work. My routine is to come home, grab a shareable snack, flop on the couch and chill out while snuggling with the dogs, reading and sharing my snack with them. (Truck stop donuts are their favorite.) I haven't been getting a lot of sleep since I started reading Midnight Exposure. Hopefully I'll finish it tonight and I can get some much needed sleep tomorrow night. So what's the deal with the blurry photo of a street light? It's not a street light. 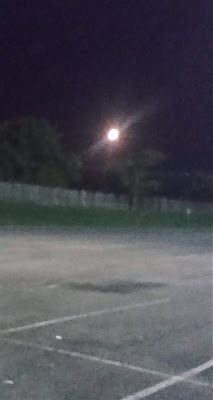 It's the moon! On the nights I'm not being blinded by lightening and/or monsoon-like rain, there has been an awesome AWESOME moon barely hanging up in the sky. It's been HUGE and crazy bright and so low in the sky I feel like I can reach out and touch it. Pretty incredible, even if my photo isn't. Join me over at Ginny's Yarn Along to discover what others are knitting and reading. I am loving this Regia 6-fadig yarn. 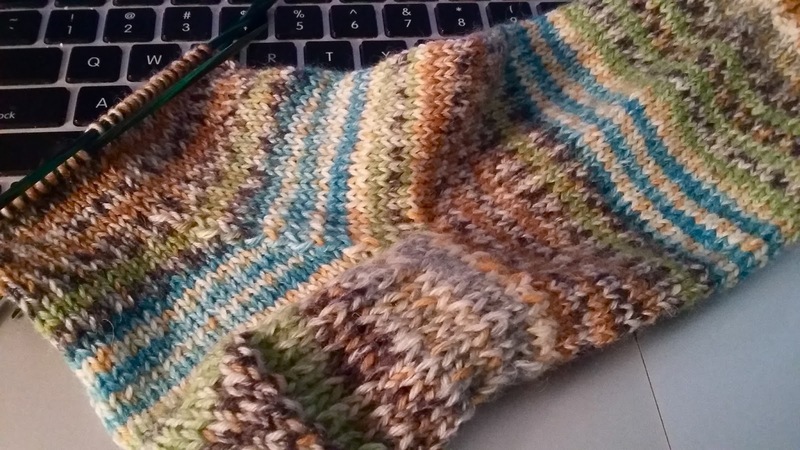 The sock is practically knitting itself. 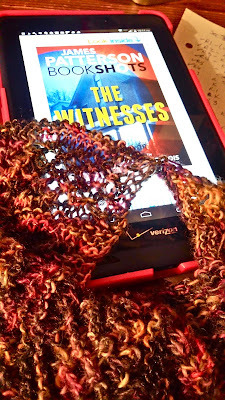 These days I only have about 30 minutes a day to knit, and I'm knitting while I'm reading my email. 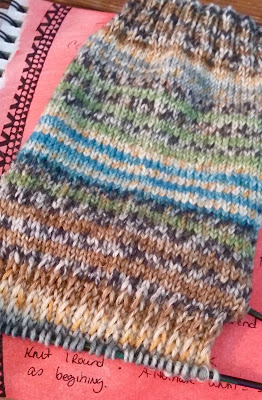 But despite my lack of knitting time, this sock is coming along fairly quickly. This is the fifth time I've attempted to knit with this poor yarn. 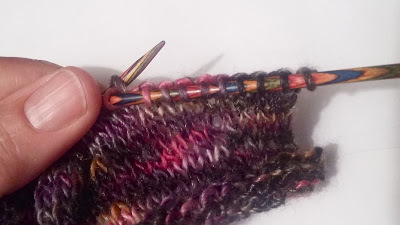 This poor Pittura yarn has been knit and frogged four times so far but I think the fifth time's the charm. 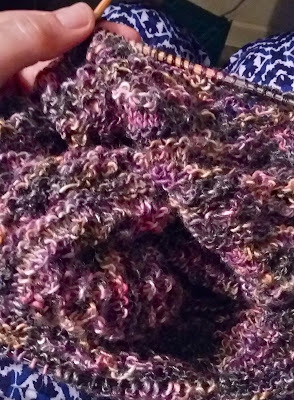 I think it's going to be happy being a Starshower cowl. The cowl's texture may not show up too well but then again.... I think five may just be the magic number. And look how well Starshower fits into my new project bag. 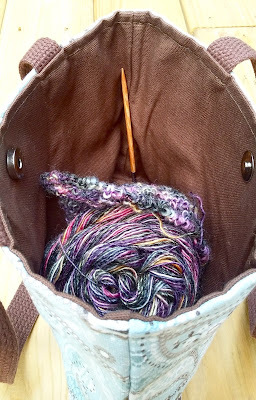 I love LOVE my new knitting bag from CreativeJenV. 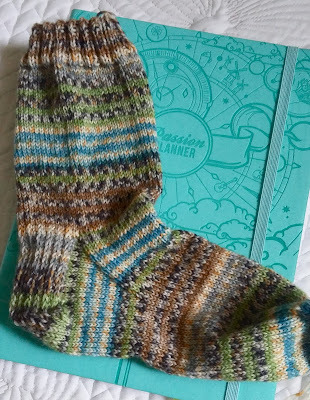 It's the perfect size for a smallish (but bigger than a sock) project. I'm so pleased with how sturdy the bag is and how it stands up by itself. Oh, and there's no velcro in sight. 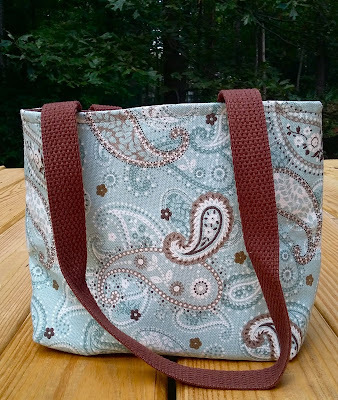 It's the perfect project bag! Very creative post title, right? Yeah, it's late, late the night before or early, early the morning of (depending on your sleep cycle) Yarn Along Wednesday. It's too late/early to think creatively. I'd like to say, "I am reading" but in all honesty, I've only read the back cover of The House Between Tides by Sarah Maine. I just picked it up from Barnes & Noble today/yesterday (once again, depending on your sleep cycle.) I was walking down an aisle looking for my daughter and not searching for anything to read when suddenly this book reached out and grabbed me. It practically jumped up and down and screamed, "Read me! Read me!" I felt compelled to buy it. I hope I enjoy it. As for my knitting... you may notice, that's not Twisted in the photo. Nope. Twisted is gone. I had to face facts that my yarn choice just wasn't going to work. Twisted has been frogged. The yarn is now thinking about becoming a Starshower cowl. The knitting that is in the photo is socks. Well, sock. 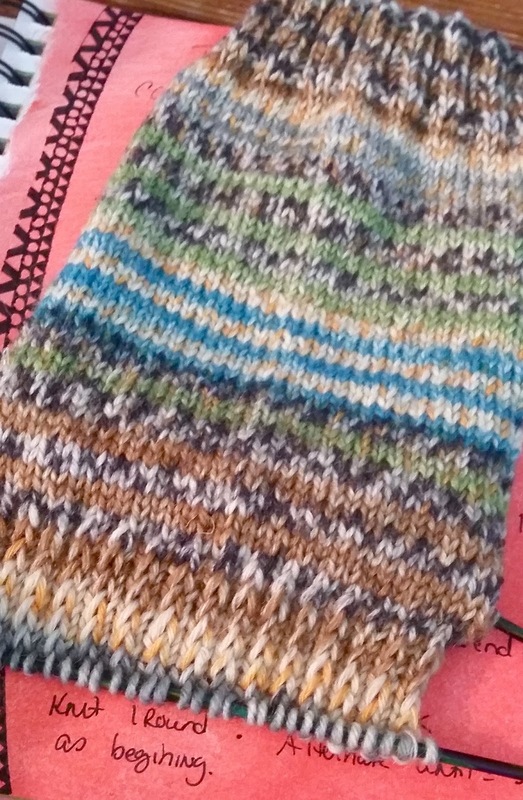 A simple stockinette sock knit from the Regia 6-fadig I bought the other day at Knitting B's. 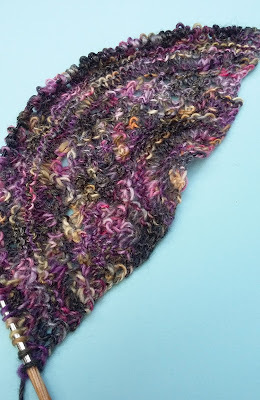 I am loving LOVING this yarn. I love the colorway and the sock is practically knitting itself. It's taking every ounce of strength I have not to go back and buy the yarn in every colorway the shop has. 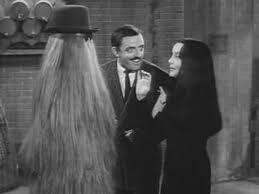 So, that's my Yarn Along story for the week. 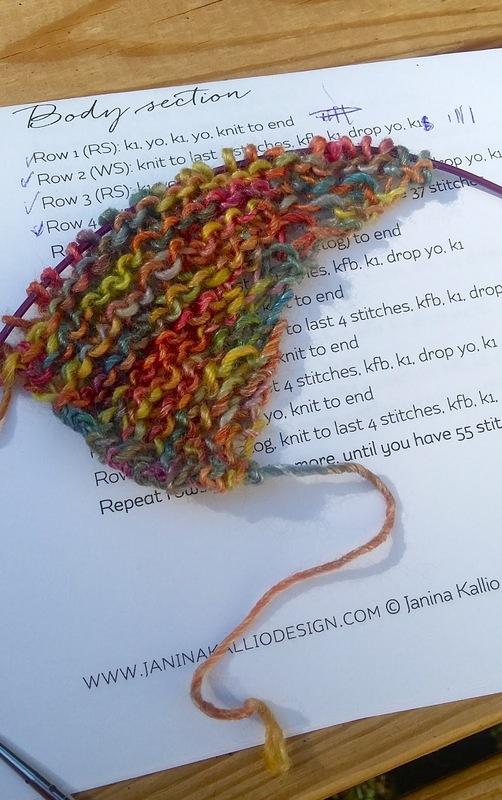 Go check out Ginny's blog to read others' Yarn Along tales.